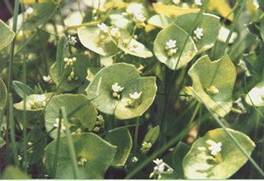 Due to it’s small but variable size, Claytonia perfoliata can be planted and seeded quite densely. No recommendations found. Plants may need to be watered during first summer of establishment. No specific information found. Plants do germinate quite rapidly from seed. 2. Pojar, J. and MacKinnon, A. Plants of the Pacific Northwest Coast. Lone Pine Publishing, Redmond, WA. 1994. 4. Young, Betty. 2001. “Propagation protocol for production of container Claytonia perfoliata” Donn. ex Willd. plants (Container Seedling); Golden Gate National Parks, San Francisco, California. In: Native Plant Network. URL: http://www.nativeplantnetwork.org (accessed 9 May 2004). Moscow (ID): University of Idaho, College of Natural Resources, Forest Research Nursery. 6. Jacobson, Arthur Lee. 2001 “Wild Plants of Greater Seattle” Arthur Lee Jacobson. Seattle, WA.